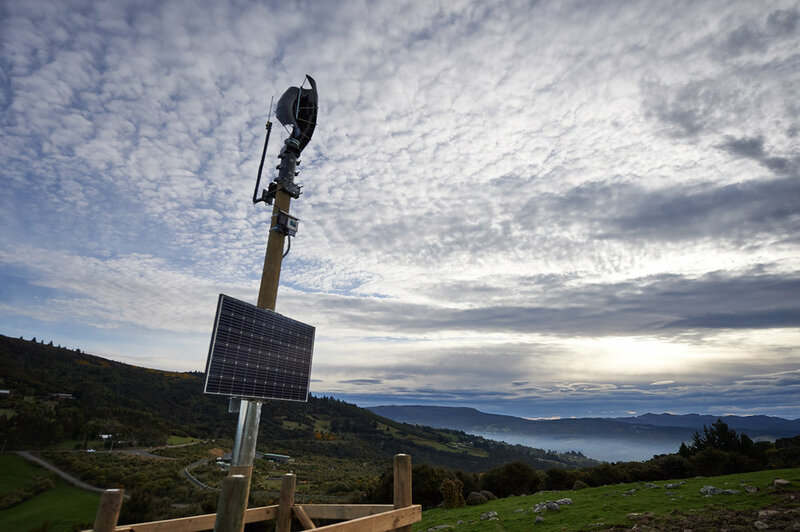 On the 29th of August, with the generosity of Thinxtra, we began the process of installing the SIGFOX signal tower. This tower is designed to allow us to remotely monitor our predator traps, reducing the amount of time and effort we need to spend checking traps that may or may not have caught a pest. A purpose made sensor placed on each trap will automatically send an alert via the tower, telling us which trap has gone off. We started by digging a hole large enough to stand the tower (a power pole) in. This job was made significantly harder due to the rocky nature of the site. Eventually our digger driver Gary managed to get the hole to the right depth (about 2.2 m) and the process of standing it up could begin. Once up all of the necessary electronics could be installed and connected. The tower is powered by a combination of a purpose made wind turbine and a solar panel, both of which charge the huge batteries located at the base of the tower. The final step in the process was to put a fence around the base to prevent stock rubbing on the pole and potentially damaging some of the equipment. The whole process took three days and proved to be quite a serious undertaking. Thanks to Sean and the team at Thinxtra for donating, designing and constructing the tower, as well as coordinating the install of the technology on site. A huge thank you must go out to Fulton Hogan for donating their time, labour and resources; without their help installing the pole would not have been possible. Local electrician John Pringle was a huge help during the install, particularly for his solar panel expertise. Finally, special thanks to Ben and Raewyn Waller for kindly allowing us to install the tower on their property.